The ribbon cable seems loose on the connector. There's no real fit to it, it just falls out. Is this to be expected? If so, what solutions are others using? Hot glue? I'm not in the office to check, but the ribbon cable connector should have a locking feature. Insert the cable, and try sliding the black and gray parts together. Something should move and lock the cable in place. Thanks! It's pretty obvious once you know it's there, but a little hard to spot if you don't. For anyone else, the black tab on the back of the connector rotates. When it's pointed up (90 degree angle with the PCB/connector), the connector is open. Rotate it down so that it's parallel to the PCB and it locks. 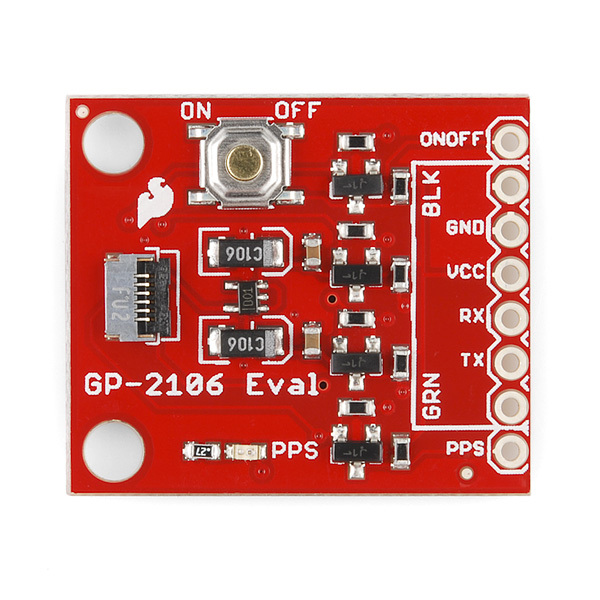 Could I possibly get exact dimensions for this board please? Time to install Eagle :) You can then open the Eagle file(s) and get the dimensions. That said, I'm all in favor of SFE posting dimensions with their boards, so here's the dimensions in plaintext for ya. Breakout pad positions: 0.05" from width edge, 0.1" from length edge, standard 0.1" spacing between pads. 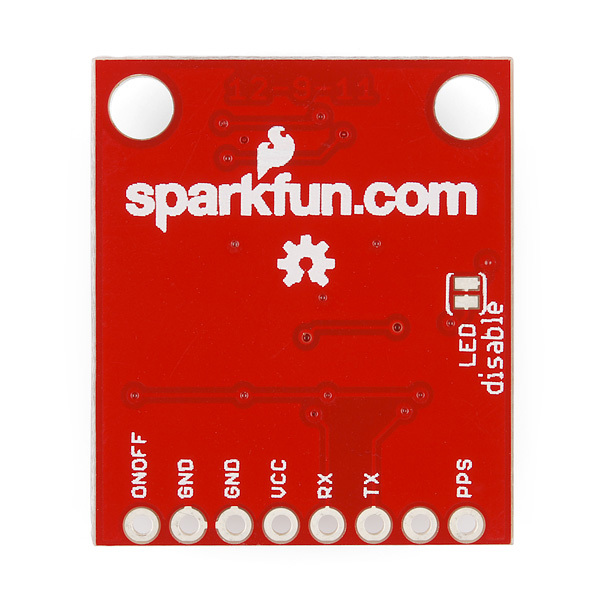 Sparkfun support suggeted i get conflictual baudrate between the gps and theOpenLog. Has you can see everythng is compact. Should be 0.27 Ohms. Did you measure the resistor out of circuit? It really shouldn't matter though, the only difference would be that the LED would be slightly more dim, and you probably wouldn't even be able to notice it. could you show some calculations regarding this? What is voltage drop across resistor and led? LED FVD: 1.8, FC 20mA, and 1.8V source voltage comes out to a 1 Ohm resistor. Question: Is there any way to remove on/off button/interface. 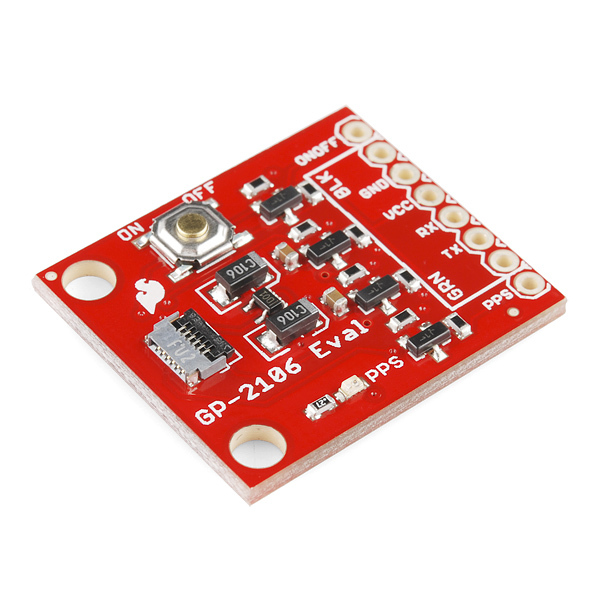 Right now, to start module I have to press that button on GP- 2106. Is there any work around ? THANKS. could anyone tell me which IC is used to regulate 1.8 v? I am using it as an external bluetooth gps to my android phone. is there any tutorial, how to interface? 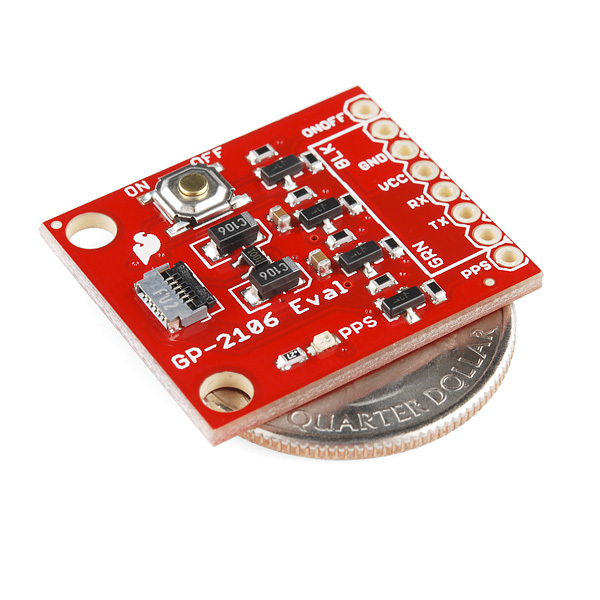 You can plug an FTDI basic (3.3 or 5V) into the header pins, see related items. Also, you can connect it to something like an Arduino pro mini (but you would need to swap TX and RX connection). I had not connected cable connector properly. Now its working.